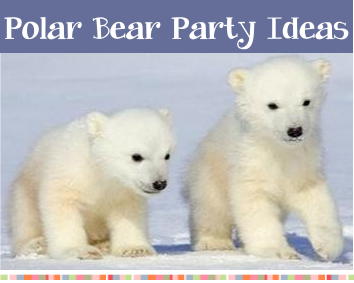 Great ideas for a Polar Bear birthday party! White invitations with white fake fur on the front or a strip of fake fur going down one side or at the top of the card. Light blue cards with polar bear stickers or stamps. Make snowflakes by cutting blue or white paper into snowflake shapes and then pasting them to circles of solid blue paper. Print out the party information on white paper (4 to a sheet) and then cut out in circles and paste in the middle of the snowflakes. Decorate in light blue or purple and white. Tie blue and white helium balloons to the mailbox or front entrance to show guests where the party is located. Hang large store bought snowflakes from the trees and doorway or make your own using large sheets of paper in blue and white. Large thin sheets of Styrofoam can be placed around the walkway and inside the party area to look like icebergs. Hang snowflakes from the ceiling with fishing line at different heights so it looks like it is snowing. Place strings of clear lights around the room and the party table. Batting or stuffing can be stretched out and made to look like snow banks on top of the party table. Light blue tablecloth with white plates, cups and napkins (or vice versa) and then sprinkle on silver or white snowflake shaped confetti on the center of the table. In glass jars on the table place white candy canes wrapped with a blue bow for guests to enjoy. In a large clear plastic jar with a tight lid place lots of blue and white candies and decorate with snowflakes. Count the candies as you are placing them in the jar. When guests start to arrive ask them to guess how many candies are in the jar. Write down their name and their guess. At the end of the party announce who's guess came the closest to the number in the jar. The person closest to the number wins the jar of candies! Easy and fun party game! Which polar bear team will be first at wrapping their partner in snow (toilet paper). Guests get into several teams of 3 and each team gets 2 paper rolls. One team member will be wrapped in "snow" by the others. On "start" the teams wrap their team mate in "snow". First team that uses all their "snow" wins! In this game the guests try and move their whole group from one side of the room to the other using only icebergs and a lot of team work. You will need white washcloths or pieces of white or blue fabric about 12" x 12". Line the kids up and give them one more wash cloth then all the kids playing. The first person in line will place the wash cloth on the ground and step onto it. They take another one and place it in front of the one they are standing on. Then the first person moves to the new washcloth and the second person in line steps onto the first washcloth. They then place another washcloth down in front of them and they all move up a space while the third person steps onto the first washcloth. Continue until all the players are stepping on a washcloth and there is one extra behind them. Then the last person in line bends down and picks up the last washcloth and the kids pass it to the front of the line where it is placed in front of the first person in line. Then the line moves up one space and they repeat until they have crossed the room. You can play this with one or more teams. 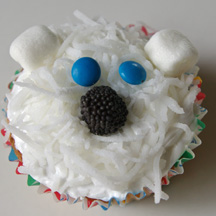 Let the guests create their very own igloo using sugar cubes and white icing. Give each guest a paper plate, sugar cubes and a ziploc bag filled with white icing (carefully seal the bag and cut a tiny hole in one of the bottom corners for an easy pastry bag). Start by having the children make a circle of icing on the paper plate and then putting the first sugar cubes on the icing so it will stick to the paper plate and be easy to take home. Have a contest or just let them have fun creating. Great to send home as a party favor! Before the party hide lots of cotton balls around the party area. Let the party guests search for the cotton balls. After they have all been found let them turn them in for candy or prizes. Scoops of vanilla ice cream - set out toppings to make their own sundaes. Wrap up party fBuy white plastic bowls and when turned upside down they look like igloos. Place the favors in a bag and secure inside the bowls.